Derrick Rose Friday provided some answers with a strong, healthy performance in the USA’s 112-86 exhibition game victory over Puerto Rico at Madison Square Garden. USA Basketball’s response ended the questioning as Rose early Saturday morning was named among the 12 USA players for the FIBA World Cup of Basketball in Spain beginning Aug. 30. The 12-player team is Rose, Stephen Curry, Kyrie Irving, Klay Thompson, DeMar DeRozan, James Harden, Kenneth Faried, DeMarcus Cousins, Anthony Davis, Andre Drummond, Mason Plumlee and Rudy Gay. The players dropped were Damian Lillard, Gordon Hayward, Chandler Parsons and Kyle Korver. “I think Derrick feels very confident. Thought he played great tonight. And these guys want to play with him,” said Coach K of Rose. Not that Rose’s inclusion is a surprise–at least to those around the team–but Rose missing practice and Wednesday’s game raised questions about whether he was hurt. He certainly dispelled that notion with aggressive play in Friday’s win. After the game and before the official announcement, USA coach Mike Krzyzewski seemed to make clear Rose was a vital part of the USA effort. Rose’s participation suddenly came into question–apparently more among media speculation–when Rose sat out both practices after the USA game in Chicago last week and then didn’t play in the win over the Dominican Republic. The narrative then became Rose’s knees were sore and he might not be able to play the heavy schedule of games. So why bring him? And if his knees were sore why was he playing, anyway? But USA officials and assistant coach Tom Thibodeau remained steadfast in support of Rose and that nothing was seriously wrong or of concern. It seemed more likely that was the plan for Rose all along, to ease him into the tournament with limited play early. The media response, however, appeared to be not to burden them with the facts. Rose did not meet with media after the game. The test supposedly was to be Friday, and Rose aced it. He didn’t start, coming off the bench behind Irving. But Rose was impressive, clearly the most unselfish of the USA’s point guards. Rose had six points and four assists in 13 minutes with three terrific plays leading to Thompson three pointers. Rose also made a three pointer and a driving score, shooting two of three in primarily a playmaking role. That was the role Rose played on the gold medal winning 2010 World Championships team, and it seems likely that will be his role once again. Curry led the USA team, which had seven players in double figures, with 20 points. Harden and Gay added 13. Faried was exceptionally active in scoring 12 points on six of six shooting. Curry and Thompson each made four three pointers. J.J. Berea had 16 for Puerto Rico, which trailed just 52-47 at halftime. Carlos Arroyo added 15 points. The USA team will play one more exhibition, Tuesday against Slovenia, before opening five-games-in-six-days pool play Oct. 30 against Finland, which has former Bull Erik Murphy. “We feel that it’s better to go (overseas) with 12 because that’s really difficult on anybody if they’re not going to be on the team to travel that far,” said Krzyzewski. Another issue for the smallish, fast paced USA team was which and how centers they will bring. Cousins was wildly erratic in Friday’s game, but he was included along with Drummond and Plumlee, apparently to counter the front line size of tournament favorite Spain with Marc and Pau Gasol and Serge Ibaka. The additions of Drummond and DeRozan, both of whom didn’t play Friday, was considered somewhat surprising, along with that of Cousins given his limited play and then playing poorly Friday. But the USA team obviously was concerned with a lack of size, which cost former Bull Korver a spot. Yet, once again the story for the USA team was Rose. This time it was less uplifting with the scrutiny on Rose and questions about whether he was healthy amid rumors and suggestions he was having knee problems. No matter how many denials Rose offered, the alternative always seemed a better story for some. Thus the scrutiny of Rose Friday. When the USA team came together in late July, the story was Rose’s presence given his knee surgeries that kept him out of most of the last two NBA seasons. Then the story was Rose as the team played its first exhibition game, Aug. 16 in Chicago. There had been other major developments, the biggest being Paul George’s catastrophic injury in the scrimmage to close the Las Vegas week of training and then Kevin Durant’s surprising withdrawal. But Rose continued to draw most of the attention after sitting out Wednesday’s exhibition game and both practices at West Point. Rose was the starter in Chicago, but Irving started Wednesday with Rose resting and Friday. Rose entered the game with 4:29 left in the first quarter and the USA leading 14-13. 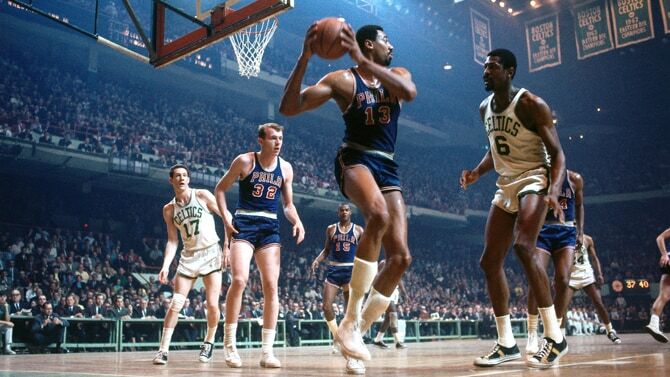 He made one of two free throws being fouled shooting and hit a three pointer. Though what was most impressive–and perhaps a relief to the doubters–was the way Rose moved fluidly and quickly, reacting well on defense and fast into the front court with the ball. The game was close early with the team from Puerto Rico taking advantage of the USA’s activity on defense and moving the ball for open threes. Rose played into the second quarter and connected with Thompson, who made a pair of threes, the first on a drive and kick pass from Rose that drew the defense and then a terrific find by Rose. The USA team, as it’s been doing in these exhibition games, broke open the game after halftime, this time with a 14-2 start. Rose returned to the game with 3:50 remaining in the third quarter and found Thompson again for a three, this time with an acrobatic over the shoulder pass while going in the air. 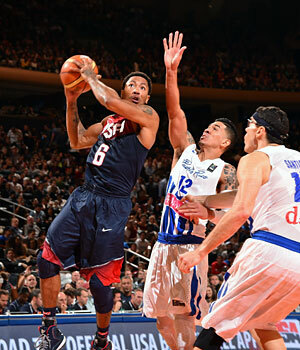 That gave the USA a 20-point lead and the USA team eased to its third consecutive victory. Thibodeau on Rose: "I think he's found the rhythm of the game. He's doing a great job of making plays. He's letting the game come to him." More from Rose: "Tonight it's not about me; it's about getting in a groove, trying to win this game and gel quickly."